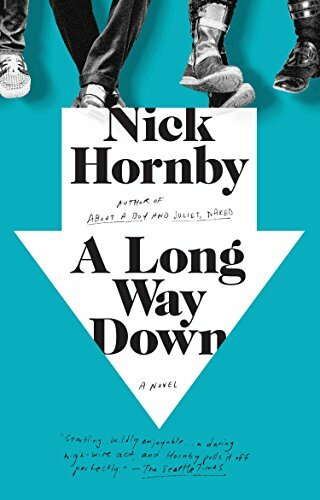 Nick Hornby's A Long Way Down is a funny book about suicide. That's how it was described to me, and it's an accurate description as far as it goes. But it's a lot more than funny, and it's about a lot more than suicide. On New Year's Eve in London, four people, unknown to each other, separately decide to commit suicide at a popular local suicide spot. Their mood of desperately wound-up courage is broken by the presence of like-minded strangers, and, somewhat irritably, they sit and talk. Eventually they leave the roof together. The book is comprised of their individual and collective adventures as they fumble their way back into the world of the living. The fun of this book is in the voices: Martin, a disgraced TV personality, Maureen, the mother of a profoundly disabled son, JJ, a guitarist whose band has broken up, and Jess, a drug abusing teenage girl from a dysfunctional family. You might well ask, where is the fun here? All I can say is, these people's observations of each other and of themselves are often hilarious. They alternate between merciless analysis and boneheaded schemes to solve each others' problems. Without any sentimentality, characters are revealed, understanding is gained, help is offered (not always with good results), and each character begins to chart an alternate way forward in life. No, I don't think it's new. Do check it out if you like Hornby. I've never read anything by Hornby, but I keep wondering if I would like his books. Maybe this one. This is a fairly quick read; maybe a good one to start with, though he's new to me, too, so I can't speak to the other ones.